When ever you see the Nite-Lite logo in our lure pages, it will mean that that lure style is available in our fluorescent Glow-in-the-Dark colors. 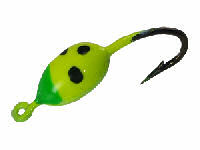 If you like Glow in the Dark Lures. Check out Nite-Lite Glow, the stuff that glows for about 8 hours and comes in 7 fluorescent glow colors. Our Nite-Lite glow is different than most others because it not only glows in the dark but also has fluorescent pigments in them that makes it ideal for daytime fishing in cloudy waters. Nite-Lite glow needs a longer light scource to activate the crystals. The sun or a LED light works the best. If you use a standard flashlight it will need about 2 or 3 minutes of constant light to activate it fully.